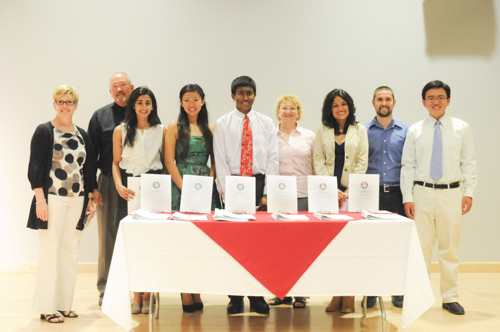 Harker’s maturing endowment program produced six scholars this year, all seniors, who each presented their papers in late April to fellow students, parents, faculty and administrators in the Nichols Hall auditorium. Established in 2009, the John Near Excellence in History Education Endowment Fund, the first of its kind at Harker, was joined by the Mitra Family Endowment for the Humanities in 2011, and since then there have been nine Near scholars and four Mitra scholars, including this year’s awardees. Harker parents Samir and Sundari Mitra (Shivani, grade 12) established the Mitra Family Endowment, which matches gifts to the annual giving campaign up to a total of $100,000. This year’s papers ran the gamut from traditional historical research to an examination of social conditions. Near scholar Nina Sabharwal chose one of the most enigmatic episodes in the personal history of the United States’ founding fathers: the duel between Aaron Burr and Alexander Hamilton that resulted in the death of Hamilton and the destruction of Burr’s political life. Dueling was regarded as the only honorable way to settle a dispute not then actionable under law, and both men were familiar with the practice both as a deterrent and as a remedy for those making disparaging remarks. Indeed, Hamilton lost his beloved eldest son, Phillip, to a duel prior to his own death and, according to “Hamilton” by Ron Chernow, Hamilton had been on the fringes of six other duels, including acting as a second or adviser. Neither Burr nor Hamilton lived an unimpeachable life. Burr schemed to enrich himself and further his political ambitions becoming a controversial figure in U.S. politics as the young country worked out its growing pains. Hamilton was equally busy trying to solidify his place in U.S. politics and history, and the two clashed in the political arena more than once. Thus, Swaminathan begins his journey to illuminate what motivated these composers to create works that exposed the cultural pressures of a then-much-overlooked segment of U.S. society. Copland’s composition was stimulated by the forced, government-mandated Mexican repatriation of the 1930, when 500,000 or more people of Mexican heritage, including U.S. citizens, were forced to return to Mexico. Bernstein’s “West Side Story” is a reflection of the frustration built up as Puerto Ricans emigrated to the U.S. when laws changed granting them citizenship and as World War II created jobs for them on the U.S. mainland. Many ended up in New York. In a more traditional approach, Mitra scholar Apurva Tandon took on a subject daunting to professional historians, the short- and long-term effects of the Nazi-Soviet Non-Aggression Pact signed in 1931 and the subsequent violation of that pact in 1941 when the Wehrmacht invaded Russia. The subject of the pact has been covered extensively by noted historians, but Tandon coalesces the primary mistakes by Hitler that led to the ultimate failure of the Third Reich to survive at all, including fighting an ideological war instead of a political/military war and the utter disregard for the economic dependence Germany had on trade with the Soviet Union that was suspended when the invasion of Russia began. Perhaps her most interesting point, drawn from a Stanford University lecture by Timothy Snyder, was that Hitler saw his invasion as the second phase of the destruction of Eastern European states, after the Soviet Union had started the job. Tandon asserts Stalin’s purges and ruthless collectivization of farms prior to the start of World War II were the opening act to the main show – Barbarossa – of destroying the populations of the satellite states to produce Lebensraum, and that viewpoint has not been widely aired. In her paper, Near scholar Apricot Tang discussed the most important amendment that never passed, the Equal Rights Amendment, as its journey was affected by two ardent feminists from the right and left, Phyllis Schlafly and Betty Friedan. One of the most controversial amendments to be proposed, it was opposed by labor unions and Eleanor Roosevelt, yet supported by President Dwight Eisenhower and the Republican Party. Roosevelt opposed it because it would block legislation designed to protect women workers from harsh factory conditions, and the amendment seemed designed to help educated middle-class women, and so labor unions opposed it, according to Bookrags.com, an educational research site. As the feminist movement grew in the 1960s, ‘70s and ‘80s, the amendment seems, in retrospect, to be an obvious step forward in ensuring full rights under the law, but it was opposed by Phyllis Schlafly, a forceful, outspoken advocate for traditional womanhood. The amendment’s path in the 1960s and ‘70s could be seen as a reflection of the changing values Americans were all struggling with as Vietnam split communities, unions lost their ability to speak for the American worker and ethnic minorities advocated for equal treatment and protection under the law. Tang’s paper takes on the complex battle that shaped up between Schlafly and Betty Friedan, who founded the National Organization of Women in 1966 following publication of “The Feminine Mystique” in 1963, which examined women’s roles beyond traditional expectations of homemaking and motherhood. Mitra scholar Warren Zhang chose to look at societal economics in his paper on how technological growth negatively affected income equality as technology development replaced manufacturing as a major component of the U.S. economy. This ambitious effort delved into the complexities of the job market, maturing understanding of modern economics technological growth and what it meant to everyone from university graduates to line workers in assembly plants. He goes on to discuss in depth the changes effected by rising wages for the college-educated, the effect of unionization on both workers’ earnings and their college-educated counterparts. Finally, Zhang presents evidence that the rise in wages for college-educated workers and their ability to work more efficiently due to technology (computers) and the drop in unionization has created a dichotomy in our economy that is not sustainable: “Because modern innovations only make a small subset of skilled workers more productive, they induce damaging, even crisis-provoking, inequality,” Zhang said. “The important thing, and the crux of my paper, is this idea (that) skills buy technological change. If you work with computers, if it is your job to tell the ‘robots’ what to do, to create the programs that make modern life possible, then the rise of information technology has been a wonderful thing. Next year’s endowment recipients, all seniors, have been chosen. Mitra scholars are Maya Madhavan, Anisha Padwekar and Monica Thukral; Near scholars will be Kevin Duraiswamy, Zina Jawadi, Divya Kalidindi, Connie Li and Angela Ma.